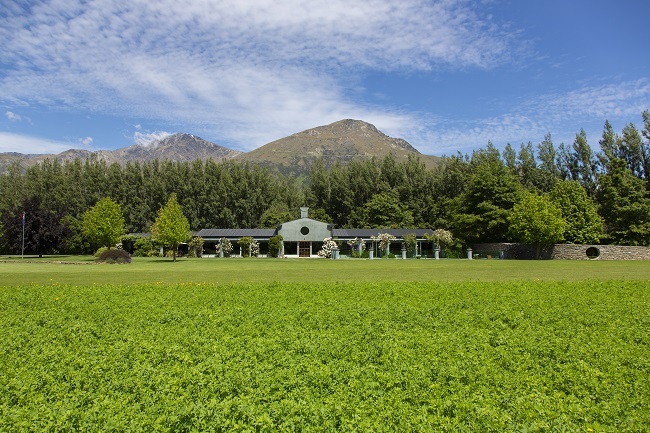 Arguably Queenstown’s most prominent lifestyle property is on the market. The Walker family’s 14.6-hectare property, bordering 600 metres of the Ladies Mile highway, is for sale by international deadline private treaty. According to the council’s rating information, the land is valued at $3,600,000 and the improvements – including a five-bedroom, 440 square metre copper-roofed house, 320sqm of vehicle/aircraft garaging and an in-ground swimming pool – at $2.81m, adding up to a capital value of $6.41m. 516 Ladies Mile also boasts more than 400 mature sweet chestnut trees. Jan Walker, whose husband Bill died in a gliding accident in Namibia in 2014, says her family’s planning to move to Cambridge, in the Waikato, where a daughter lives. She referred Mountain Scene to local New Zealand Sotheby’s International Realty listing agent Dave Fea; however, he has declined to comment. According to the sales blurb, the “renowned and admired Queenstown property” presents “significant development opportunity”. This refers to its location within a proposed fast-tracked special housing area (SHA), which could see 2000-plus medium-low-, medium- or high-density dwellings on 136ha either side of the Ladies Mile highway. The masterplan was approved by the council in 2017 but is controversial as many people believe Ladies Mile should be retained as Queenstown’s rural gateway. However, there’s already a precedent – the Queenstown Country Club retirement village, on the other side of Howards Drive from 516 Ladies Mile, is already under construction as an SHA. Last year, the government also announced a $24m interest-free loan for Ladies Mile infrastructure. Recently, however, mayor Jim Boult said he’d like development put on hold till NZ Transport Agency sorts out traffic congestion in the area. Other development ideas suggested in the sales blurb are further retirement housing, a world-renowned education/innovation hub, private school, private lodge/resort, equestrian centre, deer farm, commercial winery/cheesery, artisan gallery “or any number of tourism-related gate-sale enterprises”. This property also hit the headlines in 2016 when Delta announced plans to fell 29 trees along its highway border that were growing into powerlines. A ‘save the trees’ campaign was successful, however. The sales deadline is February 15, though any earlier offer could be accepted.